I installed Instant messenger on my computer this weekend and am officially in touch with the world now – or at least with the few people I am connected to. I know, I know – probably the next to the last person in the universe to do so. I can hear all the laughing out there. You have to remember though, I am not young and it hasn’t been high on my priority list. So, this morning I IM’d a little with Doug, and this evening with Matt. It is an easy way to keep in touch, but somehow impersonal. You don’t see the person, you don’t hear their tone of voice, you don’t even have to give it your full attention. Multi-tasking, and at my age. Still, it’s more contact than just an email. I read about Twitter recently….. Nah, that’s too much. That one seems to border on narcissism. It was another nice day here today, with weather so mild we left the house open and didn’t turn on the air. According to this chart from weather.com it is below average across most of the country. Close to 90 tomorrow though; definitely air conditioning weather. Al Gore has caused more environmental damage with his lifestyle and economic damage with his theories than any one man should be allowed to. What a weenie. It has been five days since I did any work in the garden, so the cool of the evening seemed the perfect time to go do a little weeding. Unfortunately, the mosquitos thought it was a good time to visit the garden too, those crepuscular* little critters. I barely escaped with my life, and not from the mosquitoes. Does anyone else remember that cult classic, Attack_of_the_Killer_Tomatoes? 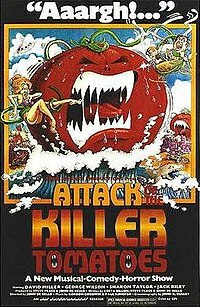 It was a 1978 parody where tomatoes rise up and attack innocent people. I think that’s what’s going on in my garden right now. In the movie the world is saved when they corner the tomatoes in a stadium and play a knock-off of Donny Osmond’s Puppy Love, causing the tomatoes to shrink in horror while the people step on them and squash them. I’m not sure if the tomatoes in my garden will be conquered that easily. Now they (the plants, not the kids) are almost as tall as I am. I have never seen such robust plants; they have some tomatoes and a plethora of blooms on them too. I don’t know how I will ever harvest them as they ripen (especially important with the cherry tomatoes) because I can’t begin to get in among them. I can’t even see in among them. And yes, they are in cages, all twelve of them, for all the good that is doing. I suspect it must be a result of global warming. Oh, wait. Temperatures have been well below normal all year and have only recently felt like summer weather. But global warming might be the cause of all the rain we have been having, which could explain why the plants are growing so tall. Then again, maybe it’s the big bag of fertilizer Bud tilled into the soil before I planted this year. I picked some summer squash and hot peppers, but the bell pepper plants are looking pretty sorry and have no fruit on them. I suspect either fusarium or verticilium wilt, but have never had problems with either before and cannot identify them with a certainty. Doesn’t matter, since there is nothing you can do for it anyway. I can’t find the zuccini squash plants for all the butternut squash vines. The butternuts are taking over the garden and I ended up taking scissors down and cutting the vines back to keep them away from the peppers. Next time I may need a machete. 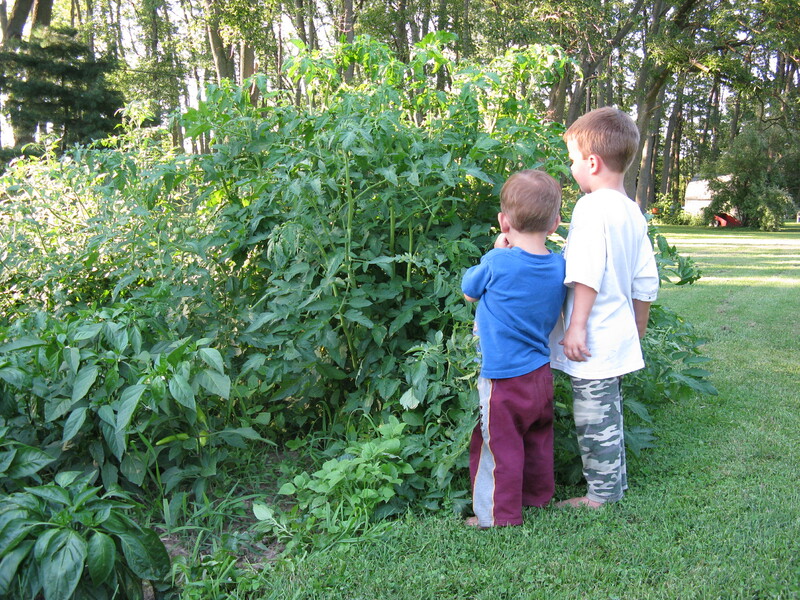 The cucumbers are nearly ready for picking, and the pole beans are finally taking off. The garden is pretty clean and relatively weed free, considering all the rain we have had. Of course with all the tomato and squash leaves the weeds don’t have a chance to find sunlight. *This word is for cousin Gay and my children, some of whom love to collect words as much as I do and maybe already know it. Who would have thought that getting away for a few days would mean Bud and I would talk about – religion? First, you have to understand that if there is one topic he never wants to talk about, it is religion. And while he is not exactly anti-Mormon, he is sort of anti-organized-religion in general. His philosophy is that religion is fine for those who “need” it, but he is not one of them. So it came as a complete surprise when he became the latest person to put in his two cents worth on the Sunday activity musings that have been going on. Oh, we talked about it a bit before, but not like this. This time he has been telling me his opinion of what the gospel is all about, what its strengths are, and how that relates to raising children to be strong in the gospel and strong as a family. This is what he wants for us, and he said it. This is the most meaningful conversation we have had about religion in a long time, and the first time he has really opened up and shed some light on what he thinks about the Church’s teachings. I have known he is proud of how our children have turned out, and gives their religious training a lot of credit for that. I have known he likes to “pass” as a Mormon when we go to church historical sites rather than ‘fess up and let them be extra nice to him as a missionary effort. I know he admires the Church and its members, – but, it’s just not. for. him. So, his view on our last Sunday’s activities is that the whole day was premised on a spiritual occasion – the blessing of a baby – and the family would not have been together had this not happened. It was not planned as a family reunion, but as a spiritual event that brought the family together. To him that distinction is of primary importance. Had we planned an outing to a public swimming park or paid money it would have been an entirely different situation. It became a reunion because it was the first time we had all been together in a very long time, and we were celebrating the addition of a new baby. Bud’s feelings are that the main focus of the Church seems to be on strong family relationships, and the activites of that day helped to accomplish that purpose. In his mind nothing should have been done differently – no activity was inappropriate under these specific circumstances. We talked about gathering children into the family, not driving them away with restrictive rules that add nothing to their religious experience. Nothing drives him away faster than someone being overly zealous. I respect that. I respect that he has spent the week pondering on this, as I have. I respect that he wants his family to live up to the teachings of the Church and have close family ties, even if he STILL is not ready to join the church himself. I respect his right not to join the Church – if/when he does he will not be lukewarm but will be valiant in his membership because he will have chosen it when he is ready. It is such progress from where we started when I joined the Church and he wouldn’t even come to my baptism. It has been accomplished through patience on both our parts, through his support for my raising the kids in the Church, and my tenacity in hanging in there and demanding time for callings and activities that I knew to be important. Our children worked to develop testimonies and incorporate them into themselves, and now use them to set examples for him. Credit also goes to all the wonderful people at church who fulfilled their callings and helped the process along. This whole period of introspection and scripture study occurred because of a statement that some people choose not to swim on the Sabbath because Satan has dominion over the waters, making swimming an inappropriate activity. I have to admit I had never heard that before. A poll of my children showed that they had, either on missions or at BYU. The interesting part is that no one can find any scripture or prophet stating this. Research by several of us shows it appears to be based on D&C 61, although Satan is not mentioned in it. Further study on that section shows it was written about a storm on the Missouri River, and the Doctrine and Covenants study guide, authorized by the Church, has no reference to Satan when discussing this section. Elaine took a D&C class given by the book’s author while at BYU, and he said nothing about Satan and water when teaching this section. Some students brought it up, but the professor did not. So, again we are back where we began. If all recreational activities are forbidden on the Sabbath, swimming is included. If any recreational activities are permitted, swimming is on the table along with everything else. As Katie said earlier today, in the 11th Article of Faith we say we believe all men should be free to worship according to the dictates of their conscience. Then we judge each other in the church. Good luck in developing what will keep your family close to the Church. Some things are requirements, but for others I suspect circumstances must be weighed and all families are different. It is the love of Christ that is unchangeable. Thus saith the Gospel According to Bud and Nancy. 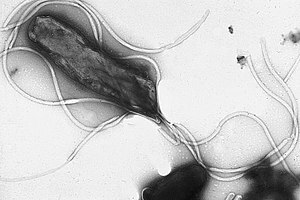 The prescription is for medicine to wipe out h. pylori, the bacteria that causes gastritis and ulcers. It is for two common antibiotics and Prevacid, a common proton pump inhibitor that reduces gastric acid production. Together they kill these bugs that live in the stomach and attack its lining. The prescription is for them packaged together under the name PrevPak. “This way it is easier to take all the medicines in the right amount at the right time,” the doctor said. “This way it is easier for the pharmaceutical company to soak the consumer for an antibiotics that are out of patent and can be purchased dirt cheap by themselves,” I thought. I have taken the prescription to four different places and no one has it in stock. I finally asked how much it is going to cost if/when I finally find someone who has it and was told they wouldn’t know unless they rang it through the system. I waited while the clerk rang it through the system, although I didn’t have her order it. Shock! My CO-PAY will be $30! So, do I go without? I’m not really having symptoms right now, but have in the past. Maybe they won’t come back? Then again, I had about three years of sometimes agonizing pain that was only relieved when I was given antibiotics for bronchitis last year. But those weren’t a long enough regimen to kill off h. pylori permanently. I guess I will keep looking for somewhere to get it filled – after I get back from Amish country. I was in the Young Women’s organization for something like a million years, as president three times in two wards, and as counselor in two wards and the stake. I went to camp with the girls a number of times. We didn’t have electric outlets. We didn’t have mess halls. We didn’t have beds. Heck, we didn’t have cabins. We had T-E-N-T-S. And sleeping bags on the ground. We cooked ALL our meals over CAMPFIRES. We tied a scarf around our hair and didn’t worry about what we looked like, since that is what everyone had to do. And we had a blast. I think something is getting lost in the translation here, that the church youth camping experiences all seem to involve cabins and prepared food. I hope they at least still take hikes and have testimony meetings around campfires in the evening (I’m sure they do). S~ and I made her ward’s flag for camp today. I asked how it would be displayed – carried on a pole or what – and she explained it would hang outside their cabin. The cabin with only one electrical outlet. And OH MY GOSH, how are we all going to do our hair with only ONE OUTLET? The flag is a red and white pennant (a flag with a V notched out at the bottom) with black lettering. It looks good and she seems happy with it. It took several hours to make the flag and applique the letters in place, but I got a big hug for it at the end, which made it worth all the time. I spent even more time working outside at Doug’s today, while also either developing my tan or cultivating a burn, I’m not sure which yet. He bought a house that is surrounded with bushes as foundation plantings, and they have all been let get overgrown. Since they just moved in I took pity on them and took my trusty hedge clippers and lopping shears with me, and spent about four hours whacking at them (the bushes, not the people). S~ helped quite a bit too. It looks a lot better, except that the detritus from my hacking is still lying in the yard – all over the yard. I only had so much energy and I figured those able bodied kids could clean up the mess tomorrow; it’s going to take quite a few lawn sized trash bags to get it all. Another long day – I got home at midnight. Tomorrow Bud and I leave for Amish country, where he managed to find a hotel room while searching online today. Oh happy day, we do get to spend some time in one of my favorite parts of the state. Finally, I would like to thank those who have left comments about appropriate Sabbath_Activities. I appreciate your input and welcome more from anyone who has an opinion. It’s amazing how quickly forty-one years can glide by when you are enjoying life together. Oh, there were rought spots and tight times, but all in all it has been an enjoyable four decades plus one year. Wow, that sounds like a long time. I feel like the same person I was those many years ago, just with a body that shows the wear and tear. How can you explain to a young person that who you are, the true essence of yourself, doesn’t change. We age physically, and we mature intellectually and emotionally, but we still are who we are. It’s no wonder the concept of body and spirit is universal throughout all cultures – a body that is only a receptacle for who we really are. The concept may be refined differently through various religions, but it is there in some form. It is a true concept, and we know it intuitively. Bud and I celebrated by having lunch together since I had a township meeting this evening and wouldn’t be around for supper. It was nice to spend time together, and we decided it was just as good as going out for dinner. Maybe better, at lunch menu prices. I ran home in mid-afternoon to meet with my visiting teachers, those angels from my congregation who check up on me monthly to make sure I am okay. It was a welcome disruption in the middle of typing up the agenda for tonight’s meeting. The agenda was so short I was sure we would be out of there within 20 minutes. It always depends on how many citizens show up with complaints and what issues get bloviated to death. The meeting lasted two and a half hours. We bought a new brush truck for the fire department; we talked about trees on road right-of-way; but first we spent over an hour on citizen complaints. I have many follow-up phone calls to make this week to try and find answers to the problems. Tomorrow I am going to Doug’s to help S~ with her flag for girls camp. I hope we can do a good job and she will be happy with it. Survey Results? What Survey Results? What happens if you have a party and no one comes? How about if you ask for thoughtful insight and no one responds (except Katie, who was disqualifired because she didn’t follow the rules)? Do you assume that everyone really has no opinion, or that they are hesitant to tell you what they really think? Maybe it just means we each need to prayerfully consider what strengthens our own faith and family and go with that. I have walked the tightrope of raising my family to be active in the Church while also respecting my husband’s choice not to be a part of it for many years now. Everyone has been married in the temple (except me, of course, but I was already married and expecting our third child when I joined the Church); everyone is raising their children in the Church; everyone is successful in their lives and careers. I guess I will continue to prayerfully follow the guidance of the Spirit to keep us close as a family. Meanwhile, life goes on. This is brush pickup week in the township, and after all the storms from the past few weeks the guys have about 100 stops to make. This is the most we have ever had, it will keep the whole road crew busy at least all week, and the calls are still coming in. The temperature has been in the 80s for three days now and suddenly the petunias are looking good and the vegetable garden is perking up. Let’s hope the weather holds and we end up with something to harvest. All I have to do now is spend several evenings weeding and pruning to get everything in shape. I attended today’s monthly luncheon held by a local property owners association and learned about several concerns they want the township to address. It is a lovely community with a series of small lakes. They brought several drainage issues to my attention, mentioned a couple vacant houses that need some serious attention, talked about an open house/garden tour they are planning for next year, and in general caught me up on some of their activities. I told them about plans for park improvements that will happen in September, discussed the infestation of invasive purple loosestrife I noticed in one lake, and visited one of the problem drainage areas. It was time well spent. Bud and I were planning to go to into Amish country later this week to celebrate our anniversay but found all the lodging in the area is already booked. I wonder what is going on there this week? Anyway, now we are trying to decide what Plan B will be. We may just take a map and throw a dart at it and go from there. The above link has had “embedding removed by request” according to YouTube. It is Weird Al’s Amish Paradise, and it is a humorous, disrespectful, and in some ways sort of accurate view of Amish life. We enjoy being among the Amish people and are sorry we are having to change our plans. The Celebrated Jumping Frog of Calaveras County, a short story by Mark Twain, had nothing on the Radiator Springs bullfrogs today. Sean figured out how to catch them this evening and the kids had frog races to see which would get back to the pond first. They are big, and they are fast. The kids were screaming encouragement, and I think it was “Trevor” that won. They had named the frogs, of course. The frog races were one of the last activities of our very busy, very satisfying day. We started at 5:30 a.m. to get to the LDS church near Radiator Springs by 10:00 for the baby’s blessing. Our extended family increased the attendance there by about 50%, and they were happy to have a pianist for Relief Society and more children for their Primary. They are a strong branch with good members, but 23 additional people makes an impact on a small congregation. Elaine is in the Primary presidency, so had to deal with the fallout from our being there. That included W~ walking in, taking one look at her, and saying, “Why do you have to be here?” From the mouths of babes… Wonder if he had some mischief planned, or if he was just curious, or maybe felt sorry for her? After church some of us went berry picking over by the creek and found two cherry trees with sweet yellow cherries, two varieties of mulberries, and several large thickets of black raspberries. We ate as we picked and still managed to fill two containers with fruit. While we were foraging others cooked dinner on the grill and got out the side dishes that had been brought; I made a blueberry buckle for dessert and we all ate till we were stuffed. The cousins enjoyed playing together and had fun jumping on the trampoline, playing pool (as in, on a pool table), swimming in the pond, running foot races around the pond, riding bikes in the driveway, and “helping” Uncle Sean catch frogs. Sean is excellent with little kids and had some of them croaking at the top of their lungs on the premise that it was attracting the frogs to them. Too cute. Most of the adults and some of the kids played games of Bananagrams and Apples to Apples, while a few lucky people managed to get naps. Katie and Elaine captured highlights of the day on their cameras, and we all had plenty of time to just sit and relax together and talk. Such are the rewards that come after many years of raising children. If you’re lucky they turn out to be people you enjoy spending time with; if you’re very lucky you may even become friends. The weather was perfect, the whole family was together for the first time since Christams (well, all except H~ who is out of town), and it was a Norman Rockwell sort of day. We all agreed we should do it again soon and set a date for the first weekend in August. By the time Bud and I go home it was 11:00 p.m.
Now for the survey, and I really would appreciate thoughtful responses. Especially from those who are familiar with the LDS faith, but not from anyone who was there today. Which, if any, of the above activities break the Sabbath, and why? When is the last time you remember a Fourth of July where the temperature didn’t manage to climb out of the 60’s? Never? Me neither. Cool temperatures were perfect for painting the kitchen yesterday; we could leave the windows open so the fumes could dissipate and the breeze helped with the drying time. Unfortunately the humidity from all the rain didn’t help, but who wants to turn on the air conditioning when it’s 65 just to remove the humidity? Unfortunately, the light and fan did not make it up. The unit is all assembled, but the electric box needs to be replaced before Bud can install it. The box sits about half an inch too low from the ceiling. Hmm. Looks like this is going to require a reconnaisance mission into the attic, but I’m afraid that will have to wait a couple days. This morning we’re off to Doug’s for the move and the pool party, and tomorrow is the blessing and the pond party. It looks like a warming trend is finally coming our way, with a high of 80 today and 85 tomorrow, so we may actually be able to get in the water without freezing. We may have a real summer yet. This weather has not been kind to my garden. The tomato plants are the biggest I have ever seen this early in the season, but they’re all leaves with almost no blossoms or tomatoes. They love hot days and warm nights, and they aren’t getting them. The peppers are struggling too, and the weeds are almost impossible to control from all the rain. I found another really good article on global_warming yesterday. I have also decided to add www.wattsupwiththat.wordpress.com to my list of links because I read it daily and am fascinated with the science behind the issue. I don’t always understand it, but it is enlightening to read anyway.